The Equidam Monthly curates a collection of articles from the best in the industry and delivers it to you every last Friday of the month. READY: learn about the hottest startup trends out there. SET: receive advice from founders and leaders of the most transformative companies. GO!!! : get inspired by successes of people just like you. In 2001, the career of Kees de Jong went through a pivotal moment. Right in between his first venture – a market research company started during university that grew to $5,5M in revenues and 120 employees in about 10 years – and the following two. Something happened that day – something that allowed him to lead his second company to grow from $1M revenues, to $3M, to $7M, …, up to $23M – and to lead his third company out of bankruptcy. So well actually, that when he left they had revenues of $200 M in revenues with about 2500 employees and $50M EBITDA. He was attending a class at MIT, in a room with 65 other entrepreneurs when the speaker said: “As you grow, this is what happens: at around 8 people, you will get these and these problems; at around 20 people, you’ll face this – and when you get to 50 employees these will appear.” He started pointing out exactly the amount and types of problems that companies face at different stages – and basically reverse-engineered a diet for growing companies. The problems suddenly appeared so logical as if they were merely a function of the complexity of the organization. From then on something was clear to him: everybody needs to know that companies at different stages face logical problems. And that’s exactly why he took some time with Daniel Faloppa, founder of Equidam, and shared his experience and insights on scaling up a company. Extending the lease of your office and making sure that your key core customer is happy aren’t the same thing – they don’t deserve the same attention. Both problems may be urgent, however one defines your future while the other is a little hurdle on the way to growth. Prioritization is a typical problem in the early stages of a company – if not in all of them. As soon as you enter the office and open your laptop, people start calling you, things land on your desk, urgent problems hit you. Making sure you put efforts and love into the right problems is the number 1 key point you should focus on in the first phase of your company. Indeed, the smaller the company, the more each team member has to handle, making prioritization harder then when people are more specialized. There are companies that succeed, and that actually manage to be great at everything. They have one thing in common: they focus, already from the start, on getting the best people in the company. This is when “good is the enemy of great” is especially applicable: your hiring decisions. You can have as many good employees as you’d like, but a single great person changes everything. Not only because he/she is good per se, but also: “Who does a great person want to work with?” With other great people. He/she will bring them in, and everything else suddenly becomes less of an hassle, things start to go faster and smoother, clients are happier, employees are happier – all because of that one great person. You should not settle for somebody that you think is ok, because that person – who now is ok – will become sub-par when your company grows and problems get larger. The people you hire need to be able to work in a company that is 5 times the size of its current state. As things discussed so far were not difficult enough, they get even harder when money is involved. In the early days, you probably won’t have the money to hire the best person for the role, they may be too expensive. This is one of the biggest reasons why being an entrepreneur is so difficult, or else anybody would do it: you have to be smart – get the best guy in on the best pitch you can to convince him/her to join. Of course all decisions, including the hiring ones, need to fall within a strategy. Being the leader of the company, you are responsible for being 3 years ahead of time. There are many techniques to do that – the one that Kees de Jong suggests starts with creating a very clear picture of where you want the company to be in 3 years. It should be as detailed as possible – specify things such as number of employees, offices, clients, etc. Once defined and shared with the team, the direction becomes clear for everyone and this has two positive implications. The first one is that, even within the management team, different people have different views on how the company is going to be. The discussion of a clear vision solves this problem and ensures that everybody is on the same page. The second reason is that, since everybody knows the direction, all the micro decisions taken each day, will propel the company towards that vision. If, for example, everybody knows that you see yourself in the German market in 2 years, everybody will keep an eye out for contacts, offices, clients in Germany. When you then decide to pull the trigger, things are going to be much easier as you can roll out way faster. It’s a subconscious process within the company that only works when you have a clearly defined vision of what your company will be like. Without it, you are continuously embattled, with yourself and with your team – not knowing if it is best to accommodate the various requests and opportunities that come up. Of course, everything will change along the way – the vision, the people, the market, etc. – but a clear vision minimizes the risks that all your time, efforts and sweat will be spent for nothing. As everything is bound to change over time, having a quarterly review of your strategy is a healthy exercise to ensure that the assumptions of the strategy are still coherent and true. Kees de Jong and his team are used to do what they call “Stop – Start – Keep Doing” exercises – that consist in identifying projects or processes that they need to stop, the ones they need to start and those that need to be carried forward. Smart companies only do what they need to do, and leave out the rest. Not stopping things only adds processes and complexity – founders need to recognize them and take consequent decisions. While the vision, or Big Hairy Audacious Goal (BHAG), is limited only by your imagination, companies inevitably face limitations based on their current state. If, on one hand, having a vision without limitations and actionable goals will never allow you to focus and reach success – on the other hand, a strategy based only on your limitations always ends up on a 15-20% growth instead of 50, 100 or even 200%. By combining the two and calculating back, entrepreneurs can have a powerful, defined idea of which constraints need to be solved first. You’ll be able to realize “You know what? We’ll never be able to grow to our potential unless we are able to, e.g., scale in 3 or 4 countries, to get a sales team of 6 people, to get developers, etc.”. You’ll find yourself focused on solving the (right) company limitations one by one, quarter by quarter, and unleashing growth. The tasks that are paramount to solve in order to get to the next level will come up beside the regular business. They will require special attention, special responsibility and special KPIs – because although they may not be urgent at the moment, they are more important if you want the company to reach the next level. Neglecting these types of activities and getting lost in the day-to-day is really easy. 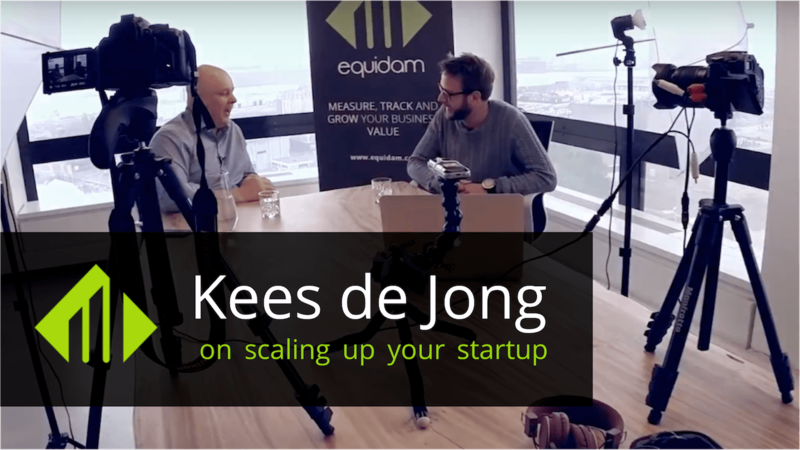 For Kees, a good solution is to make them clear, “put them on the wall”, together with the person to be held accountable for reaching them, and the KPIs to measure their progress. Being visual and transparent is important at any stage, even in smaller, transversal companies where communication is frequent – for Kees there should be absolutely no doubt about priorities. As a side benefit, clear goals will create a sort of collective knowledge and – almost automatically – drive each meeting towards discussing their progress. The result is a very focused, measurable and clear organization. When does a strategy get too risky to pursue, or when are you getting too settled and should take more risks? For Kees, the game is all in. It cannot be otherwise. You need to take all the risks necessary to become number 1, 2 or 3. Although it may appear more risky, if you don’t get to be number 3 or above, the game is worthless – you will slowly lose market share and your company will “evaporate”. In his experience, Kees de Jong never witnessed a company that was the #5 player in the market and ultimately became #1, unless it was a reverse takeover, in which the company was bought by the leader. Number 4 and below are bound to become hyper-specialized and ultimately be pushed out of the market, their margins are going to be too low, or they are going to be bought by a competitor. Entrepreneurs don’t scale for all kinds of reasons: being in the comfort zone, knowing only one or two tricks, being too loyal to the first round of employees, working too many hours, etc. But let’s focus on those entrepreneurs that do scale: what do they have in common? The answer of this Harvard Business Review report shared by Kees is: thirst for learning. Whether it is cultivated by reading, having a mentor or talking to other entrepreneurs, only a founder that continuously tries to improve him/herself will grow to the level necessary to lead a company of 25 people, and then one of 50, and so on – as those different phases required different skills. If you, as a founder, keep doing what you did when the team was 10 people, your company will not scale as you’ll be in the way of your top people and they will leave. You need to be the one that grows first. You may think: “It’s easier said than done, it’s always harder when you are inside these things”. But the whole point is: Kees de Jong was on that side of the table. He used to work 90 hours per week – and he loved it. It was his mentor that, as Kees wasn’t satisfied with how fast the company was growing, told him: “In the past 10 years, you have been working very hard on your company, now it’s time for you to start working on yourself” and suggested him to take his time and follow the MIT course. That pivotal moment happened just because he realized he forgot to work on himself – to improve himself. Do you know the value of your company? Sign up for free and find out!